My baby brother is married! I still can’t believe the day has come and gone, but we celebrated like nobody’s business and I may or may not still be suffering from the physical exhaustion that was this past weekend (hint: I totally am). We started early Friday morning decorating the hall, and by decorating I mean that I showed up and wandered around looking at everything that was already done. The wedding planner and her team pretty much had everything covered, so there wasn’t much else to do! We helped out with little things here and there and watched as the future bride and groom stressed out over last minute details. Afterwards, we grabbed lunch and then headed home to relax before having to be back in town for the rehearsal! The rehearsal went smoothly and was done in about an hour after one complete run-through. We laughed, we retained nothing, and we laughed some more. Looking back on this past weekend, I don’t think I’ve laughed so much in my entire life! #laughingburnscalories <— so there’s that ;). After the rehearsal, we headed out to the restaurant that the rehearsal dinner was being held and the laughter only continued, especially with our very vocal and hilarious 4 and 7 year old cousins! From the mouths of babes, am I right? They are super adorable and everyone was entertained, that’s for sure. We chowed down on some yummy food and felt sorry for the wait staff to have to serve over 30 hungry and needy people. After dinner, the bride and groom handed out gifts to their parents, bridesmaids, groomsmen, flower girls, and the ring bearer. And boy did they go all out! The girls got Vera Bradley bags, engraved mugs, personalized clothes hanger, earrings, a necklace, and nail polish. Sheesh! But I loved it all. So, so much! Except for the nail polish. I got a blue glitter polish that will most likely be used on special occasions that call for crazy nails. I’ll make it happen one day, don’t worry (ha!). That night, my sister and I were oh-so-ready to get home, so we caught a ride with a groomsman and his girlfriend that stayed at our house for the weekend. Once there, we discovered that the best man was planning on coming over for a fire outside in the fire pit. Umm, what? It was already closing in on midnight and us girls had to be up early for hair appointments. Little did we know that we’d stay up ALL.NIGHT.LONG laughing and laughing and laughing. Stories were told, new memories were made, and let’s just say that I have a hilarious 5 minute video of the guys taking a shot of moonshine! Antics were high that night and we all had a blast. Only a few hours later *yawn* we headed into town for our hair appointments and sipped on mimosas while enjoying some delicious breakfast from Kountry Bakery. Yum! We laughed some more, yawned a lot, and enjoyed having someone else do our hair so we didn’t have to fuss with it. #winning. Three hours later, we left the hair studio and went to the hall by the church to get ready! Dad and the guys showed up all snazzy in their tuxes, and pictures commenced. Lots and lots of pictures. And the downside to having your wedding day in July in Texas – no outside pictures! Well, not “none”, but not very many! It was so dang hot. The ceremony was beautiful and everything went off without a hitch. Tears were shed, vows were said, and just like that, my baby brother was single no more. It was so good to see him so happy! Sadly, I don’t have any ceremony pictures. Our bridesmaid dresses did not have pockets and therefore, no cell phone for pictures. After even more pictures, we walked over to the hall for the reception, found some drinks, and chatted with family and friends who came to celebrate the newlyweds. The decorations were gorgeous, the cakes were phenomenal, and the people were plenty. 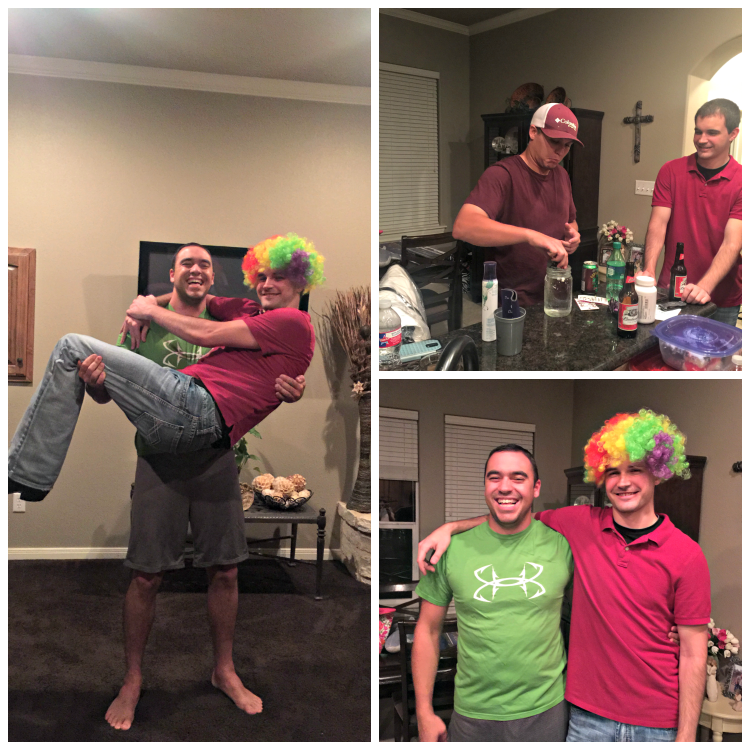 It was good to catch up with family, let loose, and just have a good time. After dinner, we grand marched like nobody’s business, and I even suckered Cory into doing it with me. He said afterwards that it was his first and last grand march – ha! Let’s just say he wasn’t a fan lol. And then it was time for the bride and groom’s first dance, the father/daughter dance, and the mother/son dance. They were all so beautiful! After all of that, we got to the good stuff – dancing the night away! And boy did I dance. I don’t think I’ve ever danced that much in my entire life. The cupid shuffle, the wobble, the chicken dance, and so many more…we danced to them all! Cousins, friends, my sister – we were out there just having a blast. And then, a few bridesmaids decided we all needed to get on stage and sing a song, and unfortunately, someone let us! I seriously do NOT want to see a video of that. Seriously. It can’t be good. And later on in the night, the groomsmen had to try to upstage us and sing as well. Their first song was a total bust, but their second one was a little more well known and the guests ate it up! 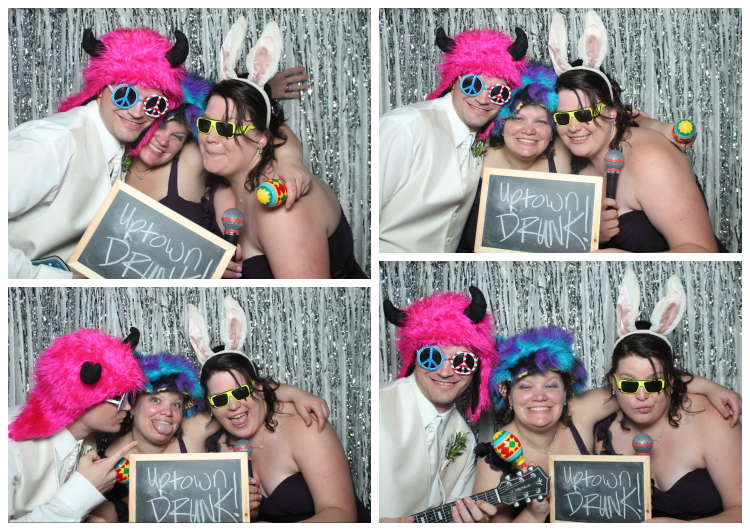 It was overall a fantastic wedding and a fun night. The photo booth got a lot of action as well. Oh, and I got Cory to agree to one dance that night, and then turned it into three ;). Shhh, don’t tell him! It was amazing to be happy, be with him dancing away, enjoying my family’s company, and soaking up the night. I may or may not have stepped on a bridesmaid’s broken glass and had to seek medical attention for my foot, but even that couldn’t deter me! I spent all of Sunday sleeping. Hangover, exhaustion, whatever you want to call it, I slept…until 5pm! #iaintmadaboutit. Monday still had me in the throes and I’m finally feeling a little less sore today. Here’s to hoping that I’m fully recovered by this weekend! It was a gorgeous wedding and I’m so happy my brother is happy. They are currently on the beaches of Punta Cana for some fun in the sun this week and I wish them nothing but many, many years of wedded bliss! You are the greatest brother a girl could ever ask for – just ask my sister, she’ll corroborate your amazingness ;). You are many things to many people: brother, son, nephew, friend, cousin, and now HUSBAND. You’re now a married man, and I’m so unbelievably happy for you and your new life. You and your bride deserve nothing but happiness and I truly wish you many, many years of wedded bliss. Your love story is much like the rest of your life – you go after what you want and you do whatever it takes to make it work. And no matter what may come your way, you remain firm, steadfast, committed, and loyal. If you asked me what your greatest strength would be, that would be it. You’re LOYAL, and I, for one, am absolutely grateful for your loyalty. You show up for your family like clockwork, and we can always count on you to be there. Please know that we do not take this for granted! We may not say it as often as we should, but it means the world to us to have you to turn to, to have you to lean on and hold us up when we can no longer carry our own burdens. In my absolute weakest moment of my entire life, your loyalty was the only thing that got me through to the next day, minute, hour, second. You showed up for me and took me into your home (quite literally), and though I’m sure I’ve told you a thousand times, it meant everything to me. When I had nowhere else to turn, in the dead of night, you showed up to whisk me away from the disaster I was facing and you cared for me. THANK YOU. During the second most difficult time in my life, you were also there. Although you were a part of that devastating day, your loyalty played a huge part in how I got through it. Not once did you blame me or even question my actions. You loved me. ME, your flawed sister that is oftentimes loud and emotional and annoying. You showed up and stood steadfast in your love for me and in getting through that time. I know that day hurt you in ways I couldn’t even begin to fathom, and I know you know, but I’M SORRY. I’m sorry that you suffered that day and for so many days after that. I don’t know if it kept you from reaching any of your dreams, but if it did, I’m sorry. From the depths of my soul, I’m sorry. But the way you rallied from that terrible day is magnificent and astounding. You are resilient. You didn’t hate me. You loved me. THANK YOU. You show up. Whether it be a family reunion, Christmas, Easter, a birthday celebration, or a weekend getaway to the lake, you go. You help set things up, clean things up, and celebrate. No matter what is asked of you, you do it. You show your support day in and day out, and we can always count on that. I can’t even begin to tell you how amazing it is to depend on your loyalty. I could try, but I’d come up miserably short. I know we have our ups and downs, the moments where our moods don’t mix and we argue and get annoyed at each other, but you’ll forever be my brother. I’ll forever love you and also be loyal to YOU. I pray that you never doubt for a second that your loyalty is taken for granted or that you can’t count on your family showing their loyalty to you. Because we will always show up and be there for you when the going gets tough, when the days are dark, or when you just need to smile. Josh, you’re loyal to your people, and I’m so thankful to be part of “your people” for the rest of my life! Linking up with Amber for THE LETTER LINKUP. What an amazing weekend! And a three-day one at that ;). Nothing fancy, no huge plans, just some much needed R&R if you know what I mean. My weekend started on Friday, and I slept in like nobody’s business! I stretched and opened my eyes to find out it was 10:30am. And then I stayed in bed until 11:30am, because why not?! I perused Facebook and Instagram, read a few chapters in the book I was into, and just enjoyed the comfort of my bed, because lately, my bed and I haven’t gotten much alone time and I was all about rectifying that situation on Friday (which I accomplished, in case you were curious). Things got a little hairy Friday evening and emotions were out of control, but things have been uneasy and a little difficult for me lately, so I indulged and found some peace in nature and no cell phone. It was pretty rewarding and I feel much better for it. Saturday, I woke up to a text from Cory saying that we should do something (his way of saying we needed a date night), to which I was totally on board! He said that I should think about it throughout the morning and then just let him know what time to head over. That sweet man – my heart melted. In the meantime, mom and I had hair appointments to do a test run before my brother’s wedding (that’s now less than three weeks away!). Talk about perfect timing, because spending some time with my mom and laughing it up was just what I needed. Followed by date night? Yes, PLEASE! My ‘no plans’ turned into some spontaneous fun and my heart was overjoyed. Especially when I had fancy hair for my date that I didn’t have to fuss with. Check, check, and check! And date night was perfection to top it off. I felt special because he picked me up and dropped me off (well, attempted to anyway) just like dating was back in the old days. Haha. I fussed around, got ready, and then was so anxious right before he got there. It was just nice, to be honest. Simple, no bells and whistles, just a date night with my man. We headed to a nearby town, enjoyed an early dinner at a local steakhouse (which was fantastic! ), and then headed to see Spy. That movie is definitely a must-see! It had the action, the humor, and the perfect amount of mystery/suspense. Cory and I both loved it, another plus. Then, heading back home, things didn’t pan out as we had planned. Apparently a big thunderstorm had come through the area since we had left and we hit two different areas that were flooded, which meant we had to turn around and try a different way to get me home. Long story short, we went the long way around to find that the low water bridge to the house was under water and we were unable to get across. So, I headed home with Cory and our date was extended to almost 24 hours :). Neither of us were complaining, it was just added time that we weren’t anticipating! So our dinner and a movie turned into that plus breakfast and then a graduation party for my cousin. We both really enjoyed this little curve ball that Mother Nature threw our way and didn’t complain one bit. Well, mostly. I had nothing with me (clothes, makeup, a brush, nothing), so that was interesting. But, it all worked out and it turned out to be a really great weekend with some R&R, reading, sleeping, date night, and family time.